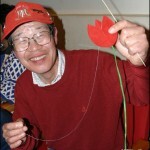 Mr. Akiyama first came to Drachen’s attention when a set of origami kite designs were emailed to us from Japan. Although the art of origami has been around for centuries, it has never been a subject of interest or collection in the world of kites. Our archival collection never had any reason to make any origami piece a part of our collection, until now. 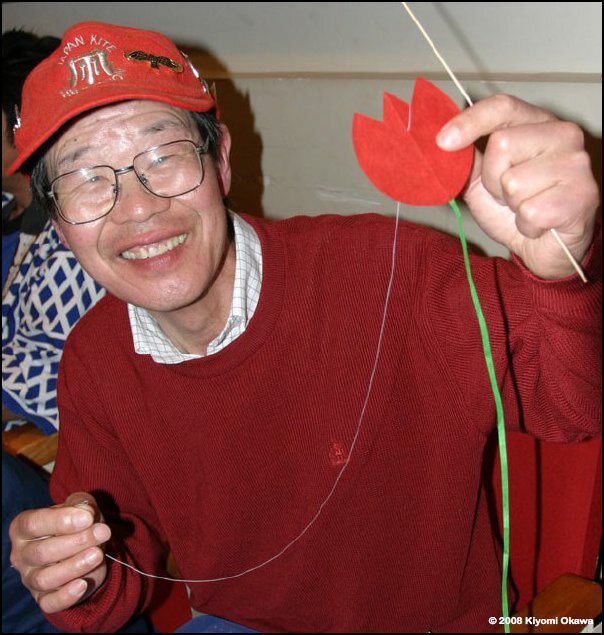 A few years ago, he became interested in making origami fly, and created 8 paper kites, no more than 8 inches in size, which fly indoors and outdoors. The kites are made from traditional sheets of origami paper, in the form of birds, frogs, penguins, dragonflies, butterflies and rabbits. The use of different colored sheets, laminated together, creates almost an animated feeling to each figure. 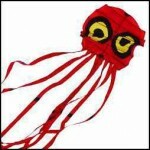 They come to life as they fly, gyrating and dancing in very little wind. Last winter, Akiyama-san took a giant step further designing flying origami kites. Arriving in our mail was a box filled of carefully crafted origami kites, a collection of all the traditional shapes of the kites of Japan. All of the figures measure 5-8 inches. Each design is defined by hand cut shapes of different colors of origami paper, when attached with glue, creates the traditional kite. 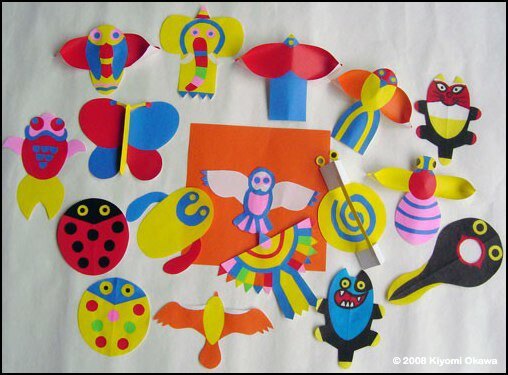 The traditional tombi, cicada, and yakko maintain their original design, but with cut out contemporary colors. 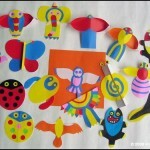 Each kite is then detailed in a line drawing so that one is able to trace the shape on the recommended colored origami paper, to collage and recreate the original kite. In carefully looking at each design, I was impressed with the articulation of the detail in cutouts, and the precision of the cutting and gluing. Even with the drawings and illustrations, few people have the skill and craftsmanship to create these kites. The collection includes 50 kites. This collection of 50 origami kites indicate a special place in time, a memorable image or images which can be treasured for generations to come. He’s documented the traditional kites in a contemporary way. After spending a good deal of my professional life in product production, I realize that this set of origami kite is more art than merchandising. Having this set is something that a collector of kites would lust after. Once again, I thank Scott Skinner, collector and founder, who saw the beauty of this set of traditional Japanese origami kites, purchased it and allows us to document the collection for all to appreciate and study. The Foundation has been given permission to scan the drawings/designs and make them available for enthusiasts to try their hand at recreating the flying forms. This book will be released in 2009. This entry was posted in 2008, Drachen, Issue 61 (Jul/Aug), Kite Columns, KL Archive and tagged art, japanese, origami.